Time ago, when I was an ADSL user in my house I had a lot problems with my internet connection. I was a bit lazy to switch to a fiber connection. 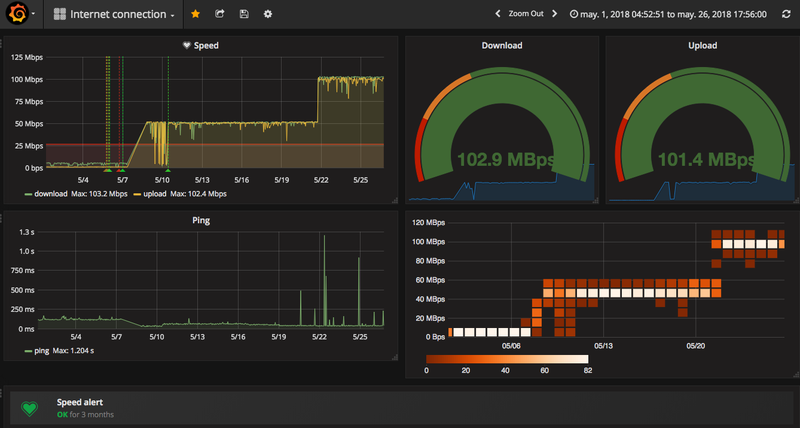 Finally I changed it, but meanwhile the my Internet company was solving one incident, I started to hack a little bit a simple and dirty script that monitors my connection speed (just for fun and to practise with InfluxDB and Grafana). Today I’ve lost my quick and dirty script (please Gonzalo keep a working backup the SD card of your Raspberry Pi Server always updated! Sometimes it crashes. It’s simple: “dd if=/dev/disk3 of=pi3.img” 🙂 and I want to rebuild it. This time I want to use Docker (just for fun). Let’s start. To monitor the bandwidth we only need to use the speedtest-cli api. We can use this api from command line and, as it’s a python library, we can create one python script that uses it. And that’s all. My Internet connection supervised again. Project available in my github. Posted on November 26, 2018, in Docker, Python, Technology and tagged Docker, grafana, influxdb, Python. Bookmark the permalink. 2 Comments.